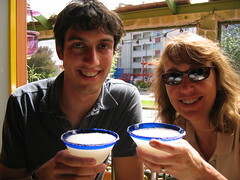 Enjoying a cold drink in the hot town of Viña del Mar. A couple weeks after my dad and Brook visited here in Chile, my mom and Dave arrived last week to spend some time in the world’s thinest country (but don’t quote me on that). We visited a vineyard, relaxed in the colorful hills of Valparaíso, and soaked up the sun in Viña del Mar. In Santiago we visited La Moneda, the presidential palace that I had seen from the outside a number of times. There I learned that what I thought to be the front of the building was actually the back. How embarrassing. Things right under my nose that I didn’t know existed seemed to be something of a theme for the trip. I took Mom and Dave to visit the agricultural high school where I work. After we toured the campus a gardening professor offer to give us a tour of the gated park. Gated park? Next to the school is a nature preserve, owned by the same wealthy Chilean family that runs the high school, whose existense had somehow escaped me. Inside were trees from around the world, lush greenery, and flying peacooks, and Australian swans. Mom and Dave also got to meet my housemates and fellow associates, which is always one of the highlights for visitors here, I think. It’s a chance to attach real people to the names and faces that they’ve only heard about. Plus, we like having visitors treat us to a dinner outside the house, so it’s win-win. Friday night I put them in a cab, sent them off to the airport, and went home. The nice part is that it had been more than a year since I last saw my parents, and now it will be less than a year before I see them again. Time flows on. As for your grip pressure, keep it light. Arnold Palmer likes to grip the club tightly, but you are not Arnold Palmer.